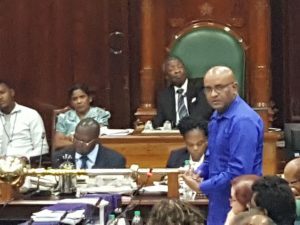 Opposition Leader, Bharrat Jagdeo on Wednesday refused to offer his own calculations on what the increased tolls to cross the Berbice Bridge should be, but he deemed the controversy over the Berbice Bridge Company’s proposed exorbitant increase in tolls a political gimmick by the Alliance For Change (AFC). “You don’t have to ask me. This is in the contract so the thing is that I don’t have to calculate. It says under the PPP (public-private- partnership) model, you have it here: 2002 what it was and where it would end up in 2026. The only two years you would have increases were those two years and by 6.4 percent and then 17 percent but look what happened from those two years increases and then you start coming down back so by this year, 202 or 2019, you would have been just above where it is now and then from 2021 a steep decline,” he said when asked what were his calculations. When pressed further, Jagdeo said directed a reporter to ask Public Infrastructure Minister, David Patterson and he did not have to justify what the Berbice Bridge Company people are saying because I think they are trying to dupe us, they are trying to dupe the country”. The former Guyana President, under whose administration the public-private partnership was made to build the US$40 million bridge, said all the Public Infrastructure Minister has to do is refuse to sign the toll order instead of seek legal advice. Patterson earlier Wednesday said he earlier held discussions with Attorney General, Basil Williams and other members of his legal team and certain decisions were taken to block an increase in tolls that the company wants to implement from November 12. The concession agreement between the Government of Guyana and Berbice Bridge Company Inc; which was obtained by Demerara Waves Online News and available by clicking this link, provides for dispute resolution by an expert or arbitration. The Opposition Leader called on the Public Infrastructure Minister to release the contract, saying that “the model does not support the increases”. Jagdeo said the revenues were doing better than the model because of increased traffic, “if anything this will obviate the need, not enhance the need for an increase” and so the tolls should be reduced. Jagdeo said the increases, which would take effect from Local Government Elections Day -November 12, 2018- were announced by Berbice Bridge Chairman, Dr. Surendra Persaud, an avowed AFC member, to portray Patterson appear as the saviour for Berbicians. “It’s all about politics as the Knight-in-Shining-Armour Patterson,” he said. Contending that government has recorded little or no improvements in Berbice since coming to power in May 2015, Jagdeo accused the AFC of concocting the announcement of the toll increases to score political points over the opposition People’s Progressive Party (PPP). “I am giving a position in relation to the decision of the Board but this is a Chairman, who I think instigated this sort of thing. This is their guy who is a member of the Board,” he said. He pledged that if his party wins the 2020 general elections, the tolls would be reduced. “We urge the minister not to sign the toll order. We believe this is a ploy. The PPP will reverse this. It’s a gimmick in the campaign season,” said Jagdeo. The PPP General Secretary hailed the bridge as a “great deal” that allowed the private sector and the National Insurance Scheme to provide funds through the model and still build a bridge that would have kept the toll at the same level as the ferry fares. “It allowed people to make some money and at the same time,we had a benefit to the country and the people of Berbice,’ he said. Jagdeo said government has the money to take over the Berbice Bridge, but Patterson has already said the shareholders appeared reluctant to sell their shares in the bridge.